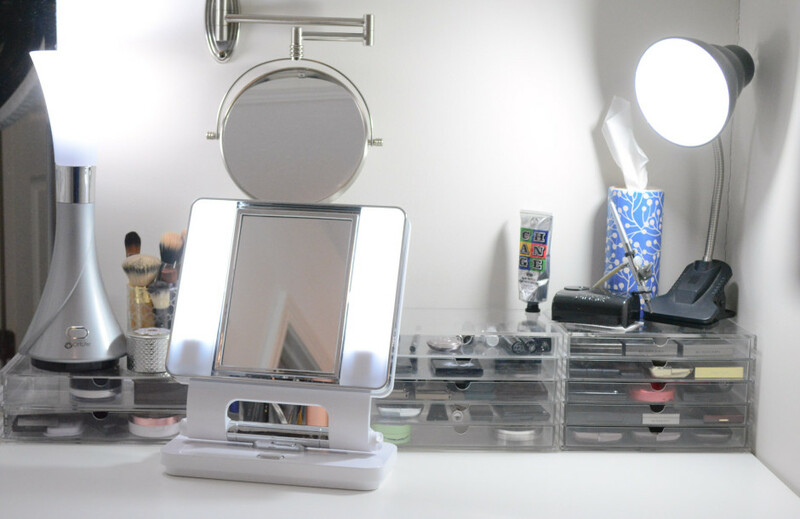 I know I’ve mentioned Ottlite lights in here and there while talking about my vanity, but I just want you guys to know – there is seriously not a better option out there for vanity lighting. Or at least, not one that I’ve ever found. 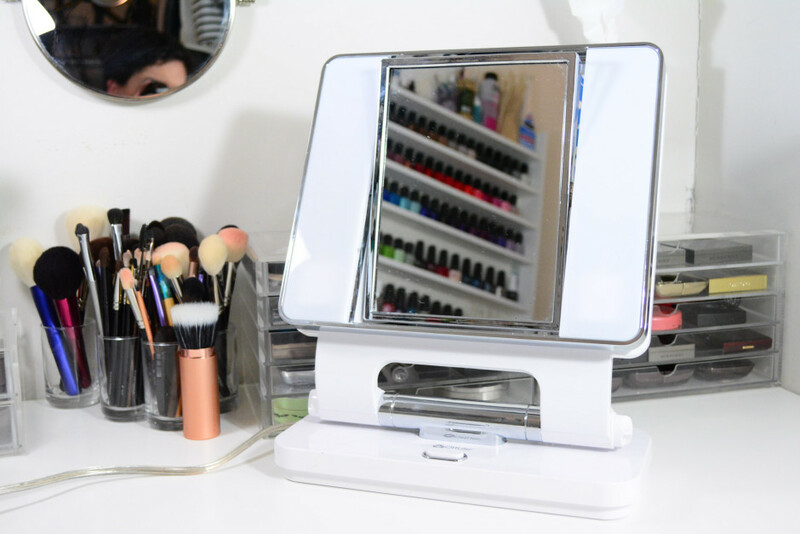 And unlike the Hollywood vanity mirrors you see all over pinterest – which run into the multiple hundreds of dollars – these will fit into any budget. This mirror was the fruit of my quest for the best-ever lighted mirror, and so far I still haven’t found one that’s better. It was also my first experience with OttLite products. And a funny thing happened when I started using it, or rather, stopped happening. You know when you do your makeup and then look at it a few minutes later to take a selfie or whatever and suddenly it’s all wrong? 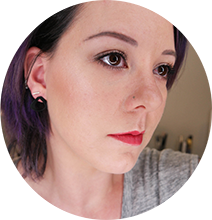 That thing where you realize your blush & lipstick have clashing undertones, or the eyeshadow you thought was soft pink turns out to be peach. Yeah, that stopped happening to me. The light is bright and clear enough to prevent any rude surprises. The other great thing about the makeup mirror is that you can (obviously) get really close to it, which is important for glasses-wearers. The mirror flips over to a 5x magnification side too, which may or may not be a good thing depending on how you feel about seeing pores. The mirror itself and the stand it’s set in are adjustable so you can get both at a comfortable angle. There are only a few drawbacks to it. For one, the mirror swings a little too freely and has a habit of sloooooowly moving to the straight up & down position. I solved that by wrapping a rubber band around the hinge between the mirror and stand. The second drawback is there’s no way to raise it, unless you put some sort of stand over it. With the height of my desk & the short profile of the mirror, it sits a little lower than I like for every day. That plus the need to free up some desk space convinced me to take my mirror to my office for days when I ride my bike and get ready at work, or for every once in a while when I go straight from work to some event and need to touch up in between. But even though I don’t use it daily anymore, I still say it’s superior to every other lighted mirror I’ve seen. Yes, even the Simple Human one. A note about that for those who’ve asked for a comparison – the Simple Human light has a good color and is almost as bright as the Ottlite one, but the fact that mirror is magnified is a total deal breaker for me. It made me queasy and distorted my face so that I had trouble with things like blush placement. It also isn’t tall enough, and I don’t want to sit hunched over a short mirror. 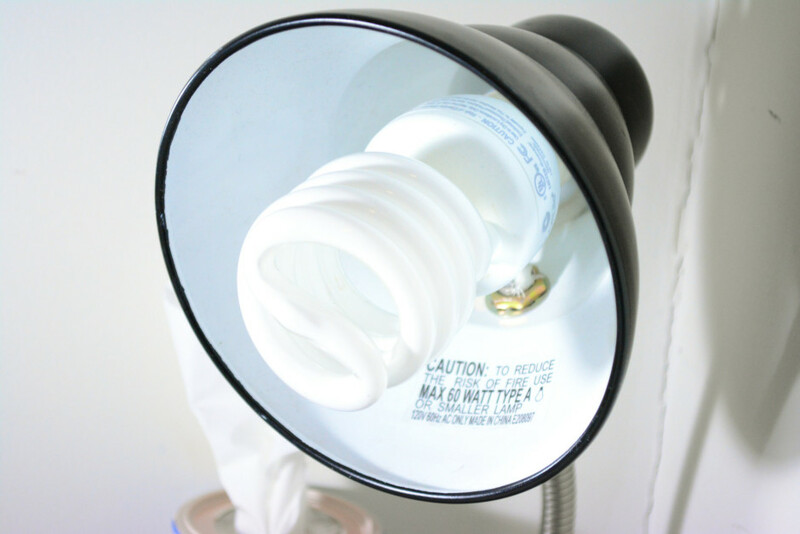 My decision to move my Ottlite mirror to work was finalized when I discovered they make regular compact fluorescent bulbs(!). I was thrilled when I first found them, and I still recommend them to everyone any chance I get. 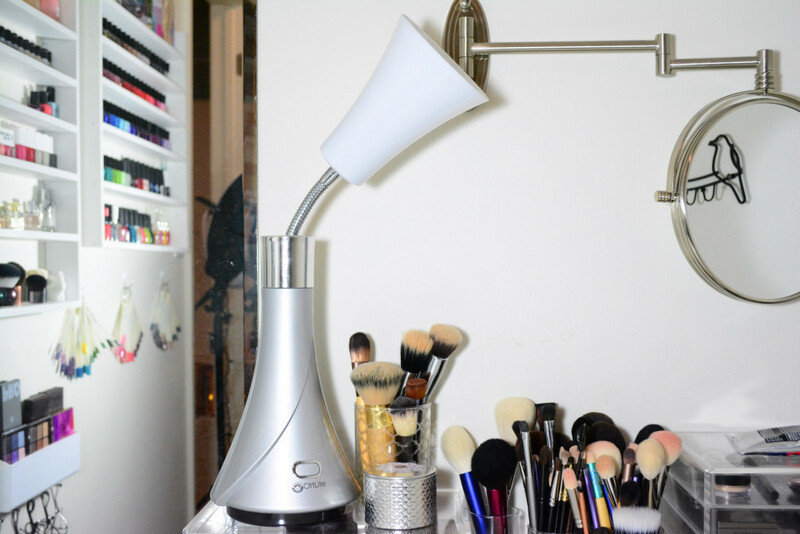 It has the same daylight temperature as the mirror (or very close, anyway) and two of the 25w bulbs are enough to light your vanity like it’s sitting in broad daylight. Mine is in the master closet, so bright lights are required. I’ve been using the same two bulbs daily for a year and a half, so even though they’re more expensive than incandescent bulbs, they’ve been well worth the price. The Ottlite tulip lamp was another one of those things that I saw online and knew immediately that I had to have. The brand very kindly offered to send me one for review and I was not a bit disappointed. It uses a 15w Ottlite CFL, so it’s just a little less bright than the 25w bulbs. If all you care about is the light, you can accomplish the same thing with their CFLs in any old lamp, but I really like how the tulip lamp looks. The simple lines are elegant, and the extendable flex neck is a great feature since you can point it right at your face. The weighted base keeps it from getting knocked over easily, and it’s easy to press the power button without accidentally moving the lamp. I definitely want to get another one so I can have matching ones on each side of the table. PS – I didn’t pull out my photography lights for these photos – they were all lit with Ottlite bulbs. these sound good! I know you’ve been a fan for a while! I’ll have to get one sometime!